The Metfriendly Lump Sum ISA is designed for the serious saver looking to invest for the medium to long term. It is a Stocks and Shares ISA. If you are determined to build your nest-egg for a financially secure future then this is for you. As Metfriendly doesn’t pay any tax on the interest and capital gains it makes on the money you invest, our ISAs enjoy higher rates of bonus and therefore higher returns than our other more traditional savings products. the potential of higher returns over the medium/long term than a Cash ISA. you can save up to £20,000 tax-free each tax year (minimum investment £2,000). your investment earns a bonus every year. after three years Metfriendly will normally add a final bonus when you withdraw your money. your spouse is eligible too which means your household could protect up to £40,000 each year from the tax man. What returns has this plan produced? 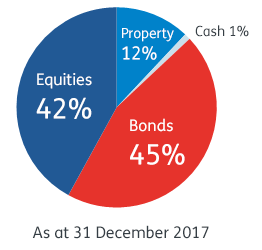 The premiums are invested in the Metfriendly With-Profits fund which is made up of equities, commercial property, bonds and cash. The example in the diagram shows the approximate “mix” as at 31 December 2017. For more information on how the with-profits fund works, please refer to How we manage the with-profits fund. When can I take money out? You can invest for as long as you want; there is no fixed term and no maximum age limit. You can contact us at any time to cash in part or all of your plan, although you should bear in mind that the plan is designed as a medium to long term investment (5 years or more). Charges will apply on cashing in within one year of investing. Metfriendly reserve the right to also apply a Market Value Reduction (MVR) so that the value when you cash in more fairly reflects our performance over the period of investment. We will send you a certificate showing your benefits and a cancellation notice. If you change your mind, you can return the notice within 30 days for a full refund. How much will it cost for advice? We do not offer or give financial advice. We do not make any form of commission. The cost of providing verbal or written information about this product is included in our overall expenses.